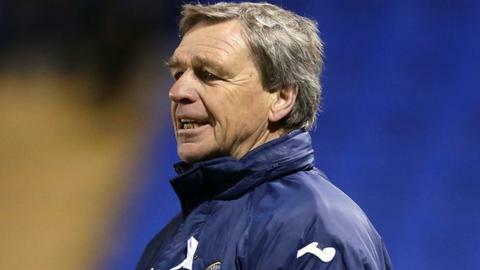 Shrewsbury Town manager Graham Turner celebrated 35 years in management with victory, the same way his long career started back in November 1978. Adam Reach's fine strike wrapped up a hard-earned win against a Notts County side who remained rooted to the foot of the League One table. Gozie Ugwu headed down Ryan Woods' 73rd-minute cross for fellow loan man Reach to thump home a low drive. Notts have now lost all four games under their new manager Shaun Derry. Town keeper Chris Weale had to make an early save when Marcus Haber was sent clear and he was also tested late on by Jack Grealish and Manny Smith. But, despite being hampered by the late first-half loss of injured midfielder Aaron Wildig, Shrewsbury were the more dangerous side. Notts keeper Bartosz Bialkowski saved from Wildig and Reach shot before striker Ugwu smashed a close-range effort against the underside of the bar, while home centre-half Darren Jones headed a corner just wide. "To finish the week with the three points has made it a pleasant afternoon. "We had better passes and better crosses and I thought we had a good shape. There was some good build-up play at times, and we have played with a bit more confidence. "It is very tight at the bottom - but you can only look after your own results. "We have Oldham next up, on Tuesday night, and they turned us over in the JPT here earlier this season - but the way we have gone about it today we are more than capable of getting the three points." Match ends, Shrewsbury Town 1, Notts County 0. Second Half ends, Shrewsbury Town 1, Notts County 0. Attempt missed. Enoch Showunmi (Notts County) header from the centre of the box misses to the right. Attempt saved. Andre Boucaud (Notts County) right footed shot from outside the box is saved in the centre of the goal. Substitution, Shrewsbury Town. Connor Goldson replaces Paul Parry. Corner, Notts County. Conceded by Chris Weale. Attempt saved. Manny Smith (Notts County) right footed shot from the centre of the box is saved in the bottom left corner. Andre Boucaud (Notts County) wins a free kick in the defensive half. Foul by Nicky Wroe (Shrewsbury Town). Foul by Enoch Showunmi (Notts County). Adam Reach (Shrewsbury Town) wins a free kick in the attacking half. Corner, Shrewsbury Town. Conceded by Andre Boucaud. Manny Smith (Notts County) wins a free kick in the attacking half. Foul by Gozie Ugwu (Shrewsbury Town). Substitution, Notts County. Enoch Showunmi replaces Marcus Haber. Attempt blocked. Jack Grealish (Notts County) left footed shot from the centre of the box is blocked. Attempt missed. Nicky Wroe (Shrewsbury Town) right footed shot from outside the box is close, but misses to the left. Corner, Shrewsbury Town. Conceded by Kieran Freeman. Corner, Notts County. Conceded by Ryan Woods. Substitution, Notts County. Jack Grealish replaces Callum McGregor. Attempt missed. Gozie Ugwu (Shrewsbury Town) header from very close range misses to the left. Corner, Shrewsbury Town. Conceded by Manny Smith. Attempt missed. Gozie Ugwu (Shrewsbury Town) right footed shot from the right side of the box misses to the right. Goal! Shrewsbury Town 1, Notts County 0. Adam Reach (Shrewsbury Town) left footed shot from the centre of the box to the bottom right corner. (Shrewsbury Town) wins a free kick in the attacking half. Foul by Manny Smith (Notts County). Jamal Campbell-Ryce (Notts County) wins a free kick in the defensive half. Foul by Joe Jacobson (Shrewsbury Town). Attempt missed. Daniel Haynes (Notts County) header from the right side of the six yard box is close, but misses to the right. Corner, Notts County. Conceded by Darren Jones. Attempt missed. Daniel Haynes (Notts County) right footed shot from the centre of the box is close, but misses to the right. Attempt saved. Jamal Campbell-Ryce (Notts County) left footed shot from the right side of the box is saved in the bottom right corner. Alan Sheehan (Notts County) wins a free kick on the right wing. Substitution, Notts County. Greg Tempest replaces Joss Labadie. Attempt missed. Callum McGregor (Notts County) left footed shot from outside the box is close, but misses to the left.